Have you ever noticed that my posts frequently start that way? There's a reason for that. I clean a lot. that there was more than one of us present in the dining room. There were spiders in the corners. But they don't need to live in my dining room. there was a spider extraction. By the way, I love to listen to Crossroads Radio while I'm cleaning. First of all...why does one sew weights to their curtains? Just wondering. I used to be a lot more tolerant of spiders until we moved to the lake. Spiders do not differentiate the outside from the in as far as I'm concerned. 99% of my spring cleaning is sucking up those critters. Can I just say, I still love the dinning room!!!! Please post a photo of the soup can vase :-) :-) Sounds up my alley! Stacey, I have often wondered why those little critters seem to love corners! I'm always walking around with a hand vac or a Swiffer duster! Drives me nuts! First of all, let me say I love your dining room! Love, love, love it! There is an episode (and a book) of a children's show, called Charlie and Lola, where Lola sees a spider and whispers to it in her sweet British accent, "I don't like you." That scene is reenacted in our home on a regular basis, as none of us likes spiders! I think it's all those legs! Ps- Your dining room is stunning...as always! Your dining room is so pretty!! Yes...those little buggers like corners!! Your dining room is so pretty and has no need for spideys hanging around! We have had a real invasion of spiders this year in OK...our exterminator said it was one of the worst years for spiders..glad he was just here. BTW we had a tarantula try to walk in the back door a few weeks ago! EEK! I'm not a fan of the little corner spiders either especially in my dining room. Love your room too. Just gorgeous. My students and I just finished reading Charlotte's Web at school so I am a bit more tolerant of spiders than usual, but I still prefer them to not be in my house! 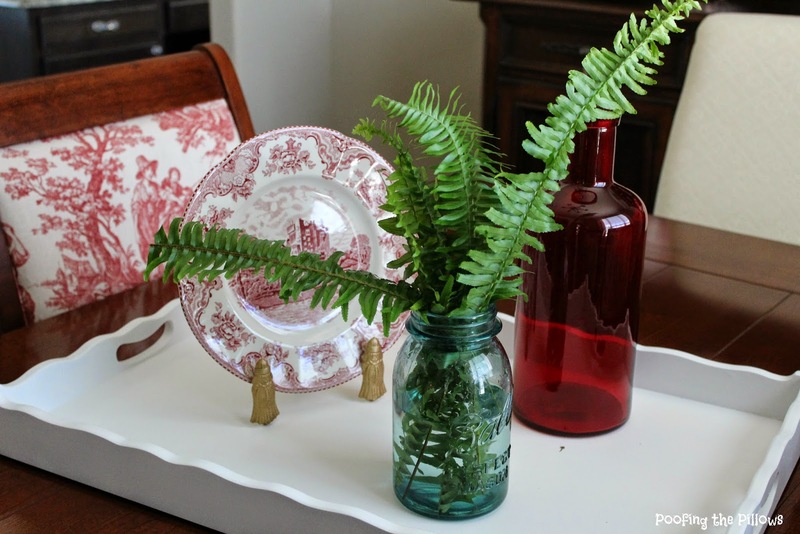 Hate bugs in the house, but love those fern leaves in the jar! You have such a beautiful dining room, I love your chandelier! 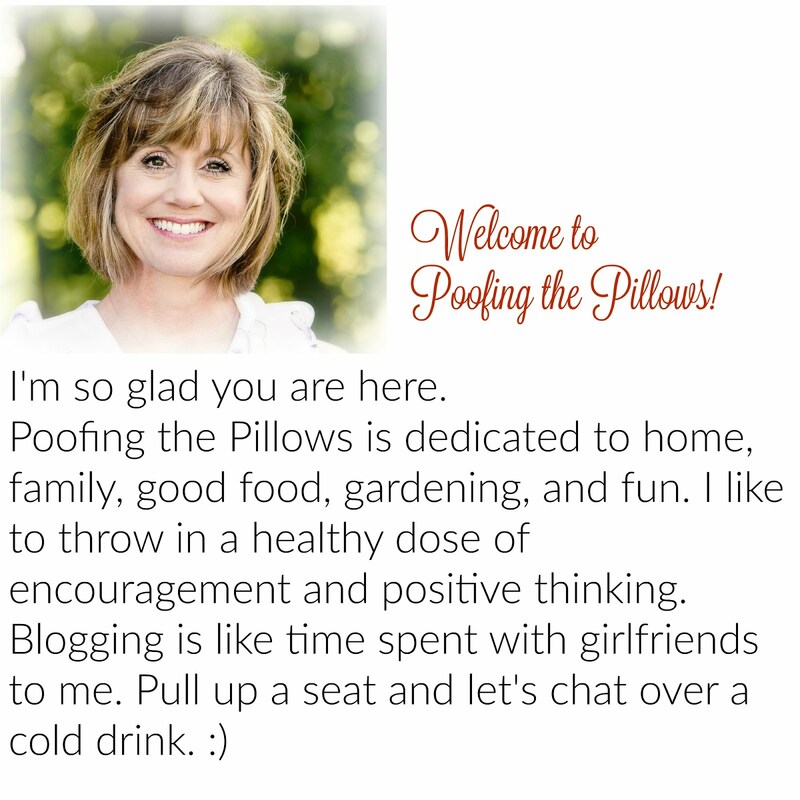 I've been doing a little more around the house this week and mentioned you on my blog this morning! Sweet hugs! Your dining room looks lovely! I love the red accents. As for those spiders, I'm glad your Dyson took care of them. I hate spiders! I just put Crossroads radio on my iPhone and am listening. I never minded the spiders until our Corgi was bitten by a wolf spider so I am right behind you...Whack and down the loo! May I ask what sort of weights you use? Fishing perhaps? I don't mind spiders so much, but frogs...that's a different story. I'm terrified of frogs! Can't even bring myself to pet a stuffed animal frog. I know...I should get help. Lol! Your dining room looks lovely! I know I've said it before, but I adore your chandelier in there! Just remember the spiders would not be there unless there were other smaller critters to eat. I prefer my spiders outside. Love the dining room. I need to clean! I know there are some spiders hiding around here. Your house looks so pretty! I wouldn't be happy about spiders, either. Your dining room is so cheerful and pretty. I'm loving it, Stacey! LOVE the iron and crystal shandy! The black looks great in there! Oh yes, those creatures do like to come in despite all my warnings not to. We have to do extractions from time to time. I believe they go to the corners because that is where naughty kids go and they know they are being naughty (smiling) Weighting your curtains really do help them hang better. I have found that really heavy weights on curtains out on the porch really help keep them from blowing around too. 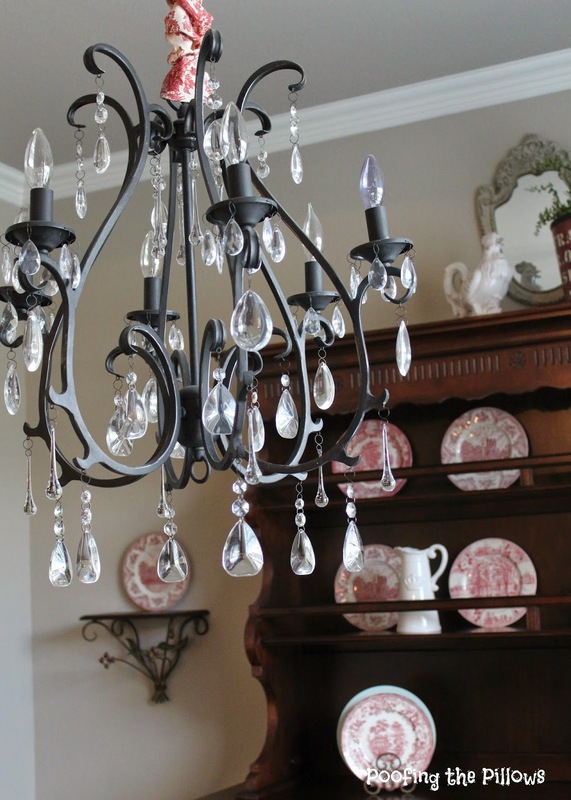 Love your chandelier, Stacey! I want something like that for our dining room. That may go on my Christmas list since my husband just doesn't get the crystal chandelier thing and thinks the light we have is perfectly fine. You love to clean? You are welcome to come to my house any time! : ) I hate to clean and do it only because I have to. Although, I'm glad to hear you say you found spiders in your corners, too. I vacuum twice a week and it seems like every other time there is a little bit of web and some bug or spider hanging out. I think the weather has something to do with it. Spiders and webs show up in this house overnight...always battling those critters...love your beautiful dining room! Went to the Crossroads Radio. Love it! Thanks for the link. ha...it must be the preferred hanging spot as I have found more than a couple in mine too! I hear ya girl! The day after I had women in my home for a party I looked over at my burlap curtains in the family room and there was a large web on top of one rod. Wonder if they thought I was decorating for Halloween a little early? lol! I always drool over your dining room! Thanks for sharing with SYC. Ekk! Not fond of spiders either. I think I see more in the summer probably trying to get in out of the heat. Such pretty pictures. I love your use of red. 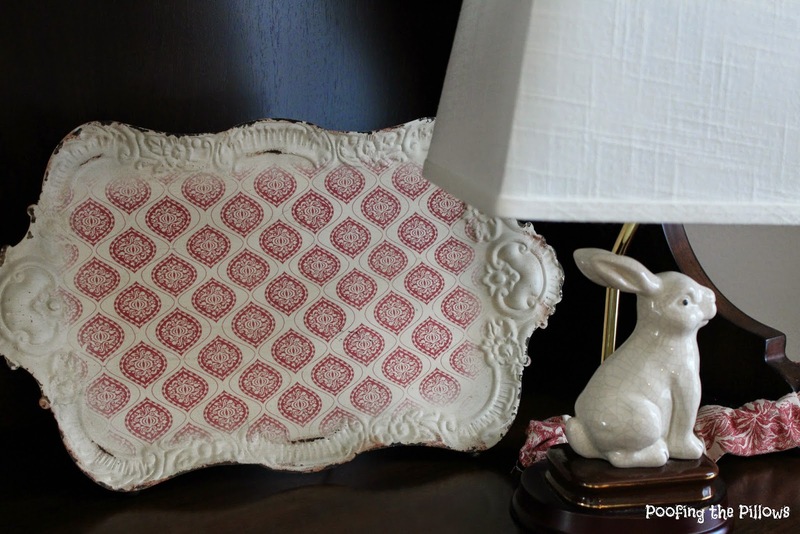 I've never seen anything like that red and white platter. I need to do some reading to catch up on what you've been up to. Thanks so much for checking up on me. I will try to post more. I think about it all the time and then just don't get it done. Hope you are having a nice summer. Hi Stacey, featuring you at SYC today. Spiders and all! lol! My Hyacinth beans will be blooming soon. I am with you Stacey...I don't hate spiders I just don't want them living in my house! 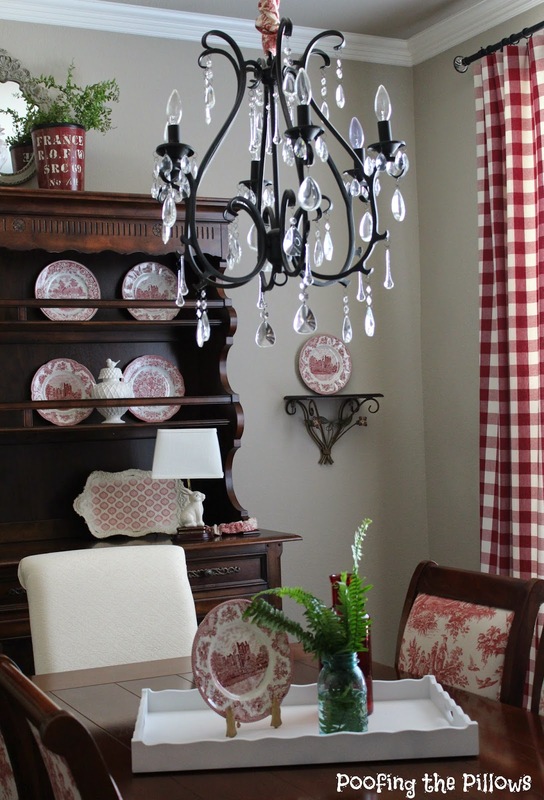 Love your pretty dining room with the beautiful red and white buffalo check drapes.